Hello Eyes On The Ring readers. Another week means another review of Ring Of Honor Wrestling. We are drawing closer to Las Vegas, Nevada and the 13th Anniversary show by the week (I’ll be there live and I can’t wait) and the event will be available for viewing live on Pay Per View. This week’s show progressed us further down the road to the 13th anniversary. 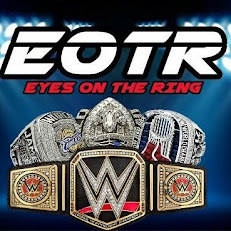 I should also mention that this is my first ROH review as part of the brand new EyesOnTheRing.com. It’s quite an accomplishment from where we were when we first started to where we are now and I’m happy to be a part of it. Now that all of the housekeeping is out of the way, lets get to the review shall we? The show opens with the current ROH World Champion Jay Briscoe making his way to the announcer’s desk to join both Kevin Kelly and Steve Corino. All three of the men that Briscoe will be facing at The ROH 13th Anniversary show will be in action tonight so he’s there to get a closer look. From there, Kevin Kelly and Steve Corino welcome us to the show, which is emanating from the 2300 arena (The former ECW Arena), which has gone through some extensive renovation. We now head to the ring for the first match of the night. Result: Tommaso Ciampa defeats Jimmy Jacobs via referee stoppage. Thoughts: As both guys were in the ring ready for the match to start, Ciampa went to the outside of the ring and started mouthing off to Jay Briscoe at the announcers table. Meanwhile in the ring, Jimmy Jacobs gets sick of waiting for him to enter the ring, so he runs against the ropes and dives out through the top and middle rope to try and hit Ciampa, but Ciampa who has recently grabbed a chair throws it right at the face of the oncoming Jacobs. Back in the ring, the match finally gets underway and Jacobs delivers a flying head scissors which sent Ciampa through the ropes back to the outside of the ring. Jacobs gets on the apron and dives to the floor to hit a downed Ciampa with an elbow drop. As the two recover and get back in the ring, Jacobs positions Ciampa in the corner and hits a sliced bread for a near fall. Ciampa rolls back to the outside of the ring and is followed by Jacobs, as Ciampa takes control on the outside and delivers a few punches to the face, which puts Jacobs in a seated position right in front of the guardrail. Ciampa runs to the opposite end and runs back at Jacobs full speed and delivers a knockout knee. From here referee Todd Sinclair stepped in to stop the match. This was the perfect way to build Ciampa as an unstoppable monster headed into his match in Vegas. He’s the only guy I could realistically see defeating Jay Briscoe to win the title and that’s if there ends up being a title change. Hanson is good but he’s nowhere near ready and is in the match as more of a place holder. and with the direction that Michael Elgin’s character has been headed as of late I don’t see him winning because it wouldn’t make much sense with the story they are trying to tell (although I’m still trying to figure out what that story is). From here we go to the next match and out comes The Romantic Touch, it’s fitting that he was on the show considering it was Valentines Day and his character is perfect for it so I can’t complain. Plus I like the gimmick even though I shouldn’t given that it’s a bit over the top and I don’t necessarily like that but they do it right with him. Romantic Touch gets into the ring and there were two women with him who had a bottle of wine along with a few wine glasses. Instead of drinking the wine from a glass like a gentleman he grabbed the bottle and chugged it, which was pretty funny. From there Hanson made his way out to the ring and we are set for the next match. Result: Hanson defeats The Romantic Touch via pinfall with the Spin kick of doom. Thoughts: There wasn’t much to this match at all. Romantic Touch had a piece of chocolate in his hand and when the bell rang he tried to hand it off to Hanson who was having nothing of it. Hanson proceeded to deliver the spin kick of doom to The Romantic Touch, which sent the chocolate flying. Hanson picks up the win via pinfall from here. Match Rating: N/A. I can’t give this match a real rating because it wasn’t really that much of a match. From here we go into the third match of the night. Result: No winner due to interference from Jay Briscoe, Tommaso Ciampa. Thoughts: Michael Elgin made his entrance in a full Karate gi accompanied with weird music, I really don’t know what they are trying to accomplish with him at this point but I guess I’ll see where it goes. Elgin grabs Moose and lifts him up for a hanging vertical suplex where he had Moose up in the air for thirty seconds while the crowd was counting along. After said 30 seconds Elgin drops Moose but Moose immediately got up from the mat and dropkicks Elgin. Moose takes over and delivers a running sit out powerbomb from the corner to the center of the ring for a near fall. Elgin recovers and takes over on offense and downs Moose near the apron from here Elgin leaps over the top rope with a double foot stomp. As Moose tries to recover Elgin ascends to the top rope and goes for a splash but Moose moves out of the way which causes Elgin to CRASH AND BURN. Elgin recovers and whips Moose into the ropes; he catches an oncoming Moose with a pop up powerbomb. Elgin hangs on and delivers another powerbomb after pulling Moose up from the ground, which gives Elgin a near fall when Moose kicks out at 2. Elgin gets distracted when he goes after Jay Briscoe. Briscoe gets mad and it draws the champion into the ring. From here Moose accidentally spears Briscoe and the referee calls for the bell to signal a DQ with no winner. Ciampa then runs to the ring and Elgin, Ciampa, and Briscoe start brawling. Mark Briscoe runs to the ring and wastes no time diving out over the top rope onto everyone who was crowded around one another with the exception of Moose who remained in the ring. Mark recovers and gets back in the ring and is immediately caught by Moose with a Spear back in the ring. This might mean that we get Moose vs. Mark Briscoe at the 13th anniversary show, which will be weird...but at least Mark gets a spot on the card. I honestly have no idea what happened to Hanson during all of this whether he did anything or completely disappeared because there was too much action going on to keep track of. I didn’t really like this finish, not so much the finish itself but the way they accomplished it because it was a mess not to mention confusing because at first I wasn’t sure who got disqualified but I think it was a double DQ which I understand because they want to protect Moose and his undefeated streak while also protecting Elgin as he heads to the main event at the ROH 13th anniversary show. This match probably would have gotten a better rating from me but the finish dragged it down a bit. From there we get a lead up video to the Alberto El Patron vs. Jay Lethal match that will be taking place in Las Vegas at ROH’s 13th Anniversary Show. Immediately after that we head straight into the main event. Result: The Bullet Club defeats Team ROH via pinfall after a Styles Clash/Duel Super kick combination. Thoughts: The match started out very slow and there weren’t to many noteworthy things in the early going other than the fact that ACH can do a mean headlock takedown. Matt Sydal who is the legal man at this point hits a spin kick to Styles and then grabs both of the Bucks by their respective heads to deliver a face buster/Flatliner combination. AJ Styles recovers and hits Matt Sydal with a back breaker, The Bucks hit another double team maneuver where Matt delivers a neck breaker to Sydal, which puts Sydal on the waiting knee of Nick in a cool combination. From here AJ Styles follows up with a jumping knee that sends Sydal off of Nick’s knee to the mat. Sydal gets worked over a bit but manages to recover long enough to hit a desperation hurricanranna after which he tags in ACH. ACH comes into the ring and wastes no time by hitting AJ Styles with a flying head scissors. Nick Jackson who is on the apron springs onto the top rope and catches Cedric Alexander with a face buster. A powerbomb double knee combination from Sydal and Alexander onto one of the Bucks gets team ROH a near fall. The bucks recover and make it to their feet, the bucks hit Alexander with a double super kick and AJ hits Sydal with a Pele kick. AJ and ACH both make it to the outside of the ring where ACH hits AJ with a hurricanranna. Back in the ring The Young Bucks hit the Indytaker on Sydal followed by a Styles Clash. Styles sets Sydal up for the Styles Clash. From here the Young Bucks hit Sydal with Duel super kicks while Sydal is hanging upside down in the hands of AJ. Once the Bucks hit their super kicks AJ Styles hits the Styles Clash on Sydal and rolls over in a pinning position to score the pinfall victory. This match was very good I actually enjoyed it for the most part but whenever the Young Bucks are in a match they always manage to go overboard on the amount of super kicks they hit per match. I understand that that’s their gimmick but they’ve completely killed the meaning of that move for me on the indie scene. Others contributed to doing this as well because a lot wrestlers on the indie scene do the move but the Bucks go overboard on too many occasions, which is one of many reasons why I don’t like them and why they don’t appeal to me as a wrestling fan. That however will do it for me and this review of Ring Of Honor wrestling television. This show did a lot of good things and had some very good progression towards the Pay Per View on March 1st. I made mention of this to a friend of mine that I was watching the show with that I was enjoying the build to the PPV because they are doing it right. That’s one problem I have with WWE nowadays because since the WWE Network launched on February 24 of last year PPV’s have seemed to lose their meaning a bit. However this has a completely different feel to it and even I wasn’t going to be at the 13th anniversary show live I would gladly pay the price tag for the PPV because Ring Of Honor has done a great job in selling it to me.